Regional Preparatory Students of Puerto Vallarta participate in the extracurricular program called "Virtual Mom," which aims to raise awareness among students about early motherhood, which involves physical and psychological process involved and even the expenses this creates. Thus voluntary students who participate must care for a virtual baby for five days, which should be fed as often as required, change the diaper, and other care that a newborn needs; the baby can not be left at home, so that young people take time from their class schedules to care for them. The director of the Regional Preparatory, Armando Soltero Macías, said the "Virtual Mom" program originates from the detection of a lack of commitment, interference and responsibility of each family in the case of teenage pregnancy students. "We are concerned about the pregnancy of the students which had regularly been between seven and 10 cases a year. Now after implementation of the program, there has only been one." In some cases, the students experience the program individually but they may also share the responsibility with their partner. The virtual baby cries when it is hungry, has colic or needs to sleep. It is also necessary to feed and change the diapers and also to hold the baby when needed. Actions of a real baby are simulated and the young women are put on a wrist sensor which identifies that the virtual baby is with its "mom." 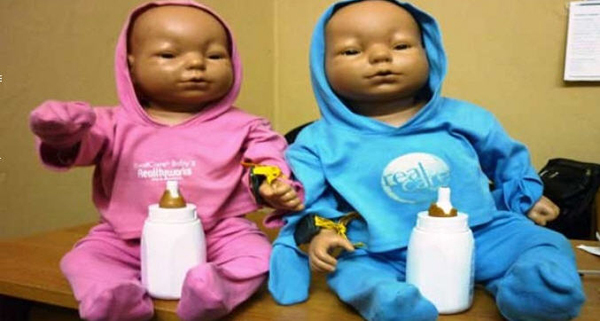 This program is divided into four stages: physically simulating pregnancy, living with a doll that records the attentions of the alleged mother, attending a live birth, as well as participation in various papers on the management of responsible sexuality.